Dr Onkar Pawaskar’s Pet Clinic and Pet Shop near Shivaji Park is what you pet-lovers have been waiting to know about for all this while. From food products to clothes for your pets, they’ve got it all. Do you have a cute, four-legged animal hopping around in your house? Is your fur ball your best friend? Are you constantly looking for the perfect food, accessories and more for your beloved cat and/or dog? Then make your way to Dr. Onkar Pawaskar’s Pet Clinic and Pet Shop which promises to cater to all the needs of your little ones (they are your babies, after all). They have a pet store near Shivaji Park, another one in Thane and one in Dombivli. 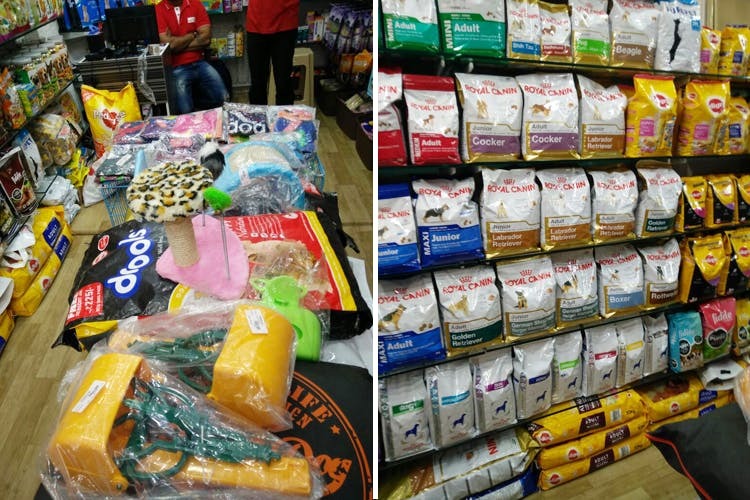 The store houses a wide range of pet food products from Pedigree and Royal Canin for dogs and Whiskas for cats. They also have weight reduction foods for dogs that tend to get overweight. The store is small but is stuffed all the products you would need for your pet. They have chew sticks, leashes, clothes, shampoos and other grooming products for your pets. They also have pet boarding, lodging and day care facilities, apart from also having a pet clinic. Basically, this pet store and clinic is a single window solution to every single thing your pet might need. Given their range of services, they are booked most of the time. We recommend making a prior appointment so you don't waste your time or inconvenience your furball.